They are unlikely to be compared in the first place, but when you start to think about it there are a LOT of things that Apple and Nintendo have in common. Just have a look at some of their flagship products of recent years and this becomes blatantly obvious. Remember Apple’s original iMac color frenzy? 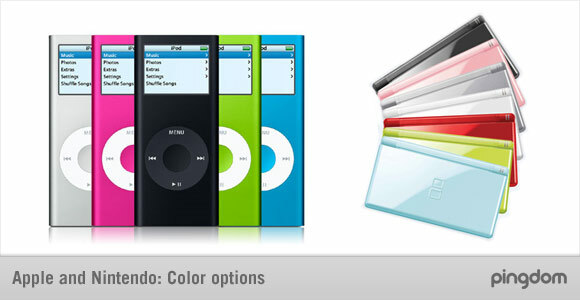 Or you could just look at the colors available for the iPod Nano. With Nintendo, just look at their Game Boy and DS Lite color extravaganzas. 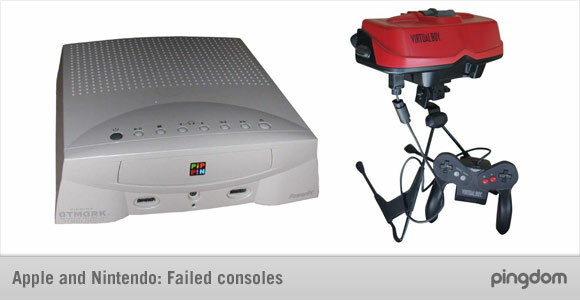 Yes, Apple actually did try to release a game console once, the ill-fated Pippin back in 1995. For Nintendo, few gaming enthusiasts haven’t heard of the Virtual Boy, also released in 1995. So, not only do they have this part in common, they did it the same year. Both Apple and Nintendo are making billions of dollars in profits every year and have profit margins that make the competition green of envy. Apple is famous for sticking with its one-button mouse year in and year out, not to mention successfully launching a mobile phone with only a screen. Nintendo has often broken new ground in making controls easy to handle (latest with their Wiimote) and games easy to play. Nintendo has made several gamepad innovations (acting as a pioneer since the 80s), and now of course it has introduced the Wiimote. Apple has also made a number of contributions, like the iPod click-wheel and the iPhone’s multi-touch interface. Nintendo has its mega-successful Game Boy and DS handheld game consoles and Apple has its series of iPods and now the iPhone. These products have been real cash cows for both companies and have boosted their brands and their fortunes. If you want to run Apple software, you’d better be running Apple hardware. Same for Nintendo. 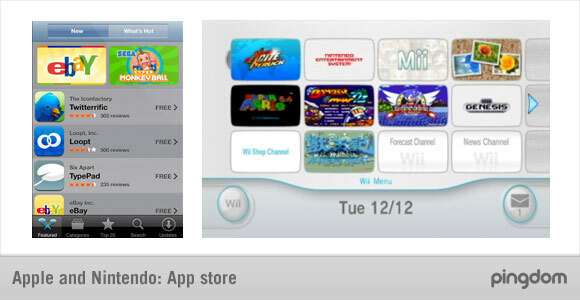 Apple of course has its famous App Store for the iPhone and iPod Touch, and Nintendo has its Wiiware for the Wii and also the DSi Shop. 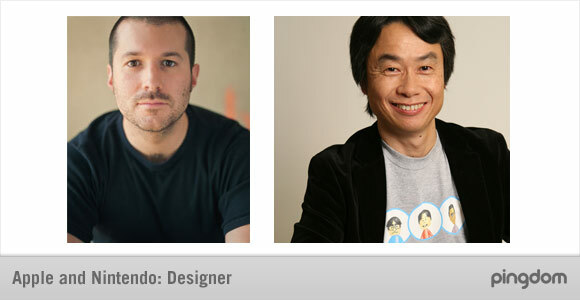 Nintendo’s Shigeru Miyamoto and Apple’s Jonathan Ive are designer superstars. Admittedly, Ive is an industrial designer (the principal designer of the iMac, the iPod, the iPhone and several other successful Apple devices) and Miyamoto a game designer, but still… Both of them have been instrumental in the success of their respective companies. Remember the Nintendo-Sega feud for gaming supremacy in the 90s? And of course, no one has been able to miss the ongoing competition between Apple and its archrival Microsoft (the good old Mac vs. PC war, never mind that the Mac technically is a PC). Did we miss any obvious parallels? Let us know in the comments! and both are really kewl!! 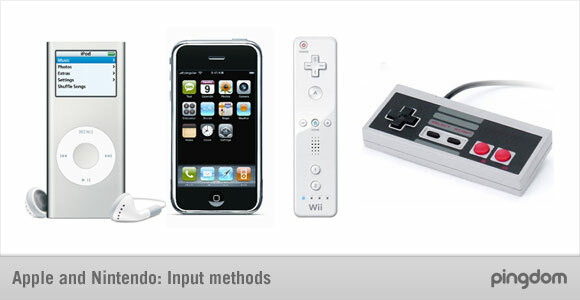 Miyamoto is originally an Industrial Designer. Every party where a Wii was placed, surely convinces one or two people to buy one for themselves. They are both customer oriented companies and both made Blue Ocean products. The other sells overpriced media players that lose their charge in 4 hours. Both have to fend off trolls. Both are able to sell their products for a price competitors can’t – even if their products are often more powerful. Have to say this ain’t criticism but admiration. And it’s a clear evidence for perfect design and marketing. Your missing some points. 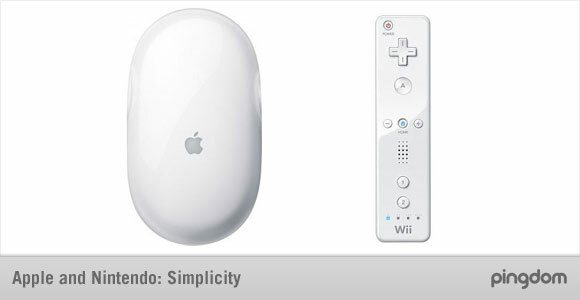 For example the white design of the Wii. It seems they tried to have a Mac-like design. Also the “simplicity” of the remote. Pretty much a try to copy the elegant design of the Mac. Just look back to GameCube, N24 or the NES and you see what Nintendo stands for in Design. You might be able to compare the Apple I to that, but really nothing more. 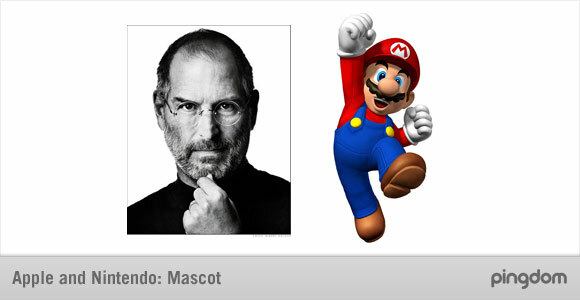 And Mario isn’t as evil as Steve is. Macs are so much more than Personal Computers. But let’s not get into that. All i know is, if Nintendo branched their license of Pokemon onto the iPod Touch or iPhone, The white house would be on red alert, and Apple/Nintendo would be deemed terrorists. Conspiracies would begin and people would say Nintendo is the Nazi of our generation, and Apple is the Süper Soldat. Basically… All hell’d break loose.